At the entrance is an equally vintage camera aimed at anything that passes by the house; a concierge to those wanting to get inside and see a gallery like no other. 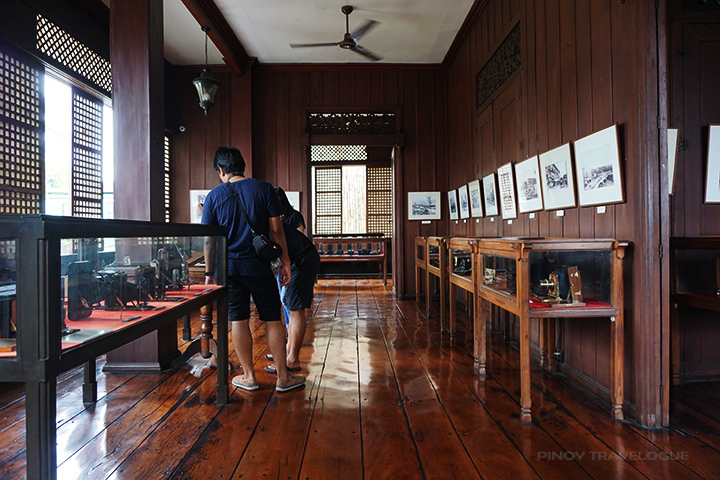 Galleria Taal, one of those houses-turned-museums in Taal heritage village, houses the impressive camera collection of Mr. Emmanuel "Manny" Inumerable, 65, heir to the imposing Spanish era home. 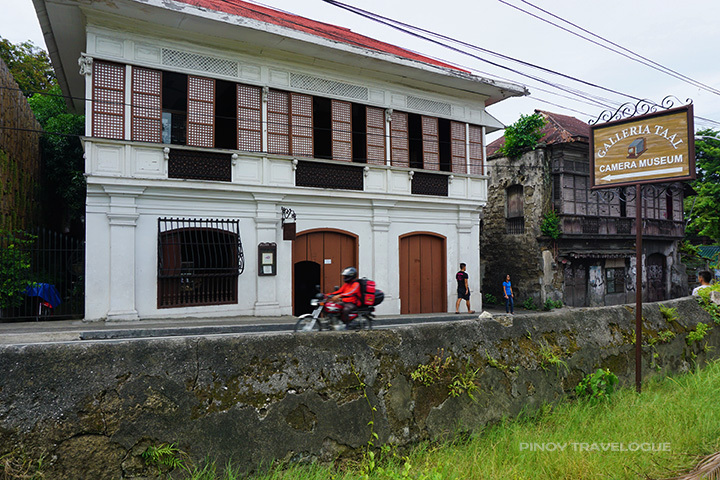 Known as well as Ilagan-Barrion Ancestral House, its ownership started with Domingo Ilagan and Maria Martinez who built the familial house in circa 1870. Of their six children, Candida Ilagan, the present owner's lola, paid off her siblings and became their ancestral abode's sole owner. Candida then married Atty. Antonio Barrion, Manny's lolo, who was notable for representing in the 1935 Constitutional Convention; hence, the house's name, "Ilagan-Barrion". Candida and Antonio had three daughters, the eldest of which was Nellie B. Inumerable, Manny's mom. The house was neglected for years after Candida died in 1975. But, along with his brother Bobby, Manny Inumerable restored the house in 2004 and since then became home not only to his grandparents' memories but also to his vast collection of devices meant to capture those life's priceless moments. The entire upper floor holds the camera gallery. 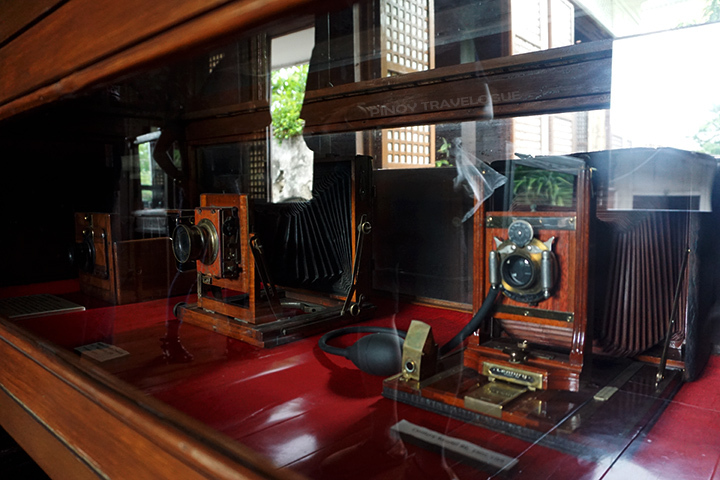 While modern cameras' ancestor welcomes visitors at the ground floor, framed photographs of Manny's forefathers greet them upstairs. Museum guests get introduced to Manny's ancestors before being walked through rooms of faded photographs and glass-paneled cases that each hold an array of well-preserved pieces — from bulky, accordion-like cameras of centuries ago up to the lightweight pieces of digital age. It's a walk-through on how cameras evolved through time, so to speak. Manny's friend John Silva, who owns most of the museum's restored photographs, found the original photo in a shoe box along with other items being sold at a flea market in Pennsylvania, USA for just USD 0.25; the American seller having no knowledge of who Rizal was. John bought and kept it for years then sold it to Geronimo delos Reyes, businessman, art collector and owner of GBR Museum in Cavite where the photo was currently exhibited. One day, an old woman came and said that it was his grandfather who took the photo; and when asked who her grandfather was, said it was Manuel Arias y Rodriguez, a Spanish photographer and contemporary of Rizal who probably has an all-access pass to the execution at Bagumbayan (now Luneta Park). At the back of the original photo was written with anonymity: "A Filipino doctor executed in the Philippines, 1896". Like most historical artifacts did, the photo raised a lot of doubts. But authorities investigated and later verified its authenticity. Hung at Galleria's wall is just a replica. 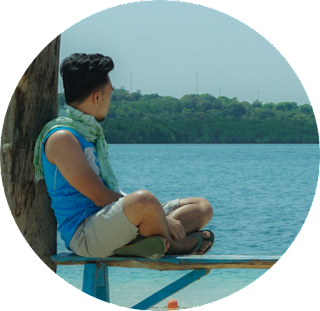 *I wasn't able to take photos of it as the story behind caught me off-guard; but most likely, you've already seen the image somewhere else — on history books or online, like it seemed so ordinary to me at first sight. 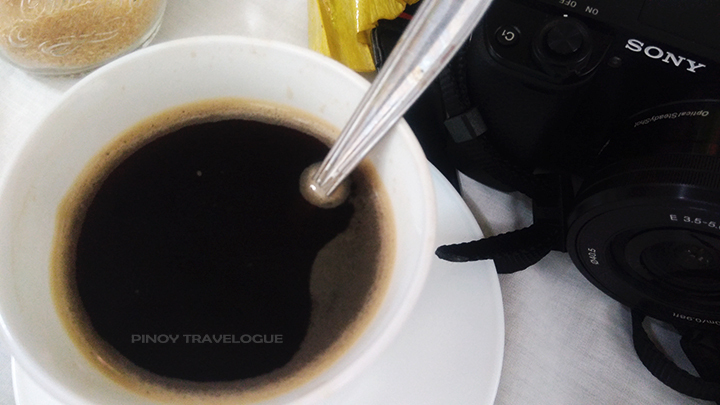 One of those modern-yet-classic pieces that really captured my fancy is the Nikon FA SLR that our guide dubbed as the "virgin camera" — it functions like a regular SLR but has never snapped a single shot, not even inserted a roll of film. It has 24-karat gold plating on all of its metal parts while the body is wrapped in fine lizard skin. 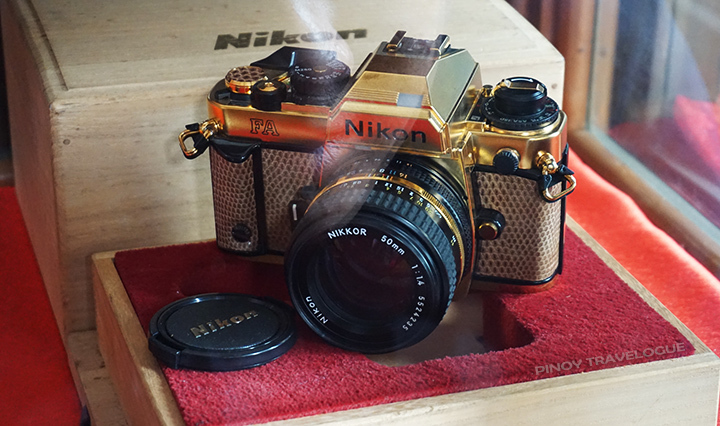 Nikon produced only around 2000 pieces of it in 1984 to commemorate FA's winning in Camera Grand Prix in Japan. 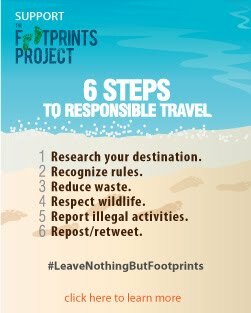 Of those 2000, only two was in the Philippines. A collector's item, indeed. 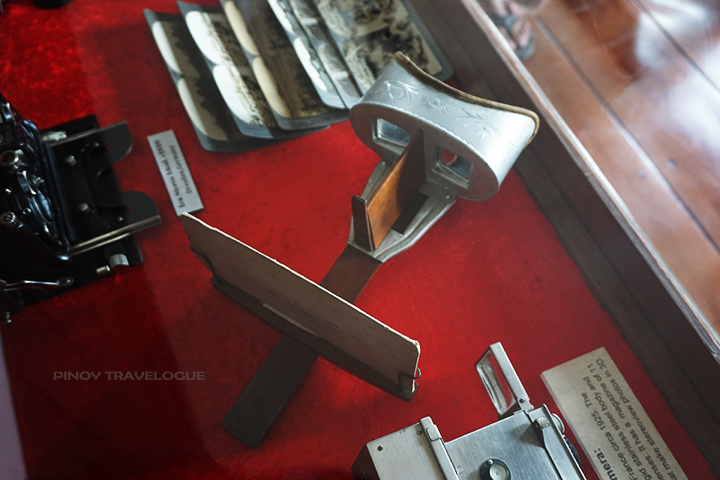 In a room full of boxy, vintage camera, Daguerreotype might seem indifferent. But the unassuming device is a collaborative invention of Nicéphore Niépce and Louis Daguerro, both regarded as the pioneers of photography. Seeing it is like gazing at your camera's great grandpa, personally crafted by those men behind your favorite hobby. The German brand camera was at the back of the recently devalued 500-Peso bill being held by a young Ninoy Aquino, who was said to have used Rolleiflex during his days as war correspondent covering the Korean War. 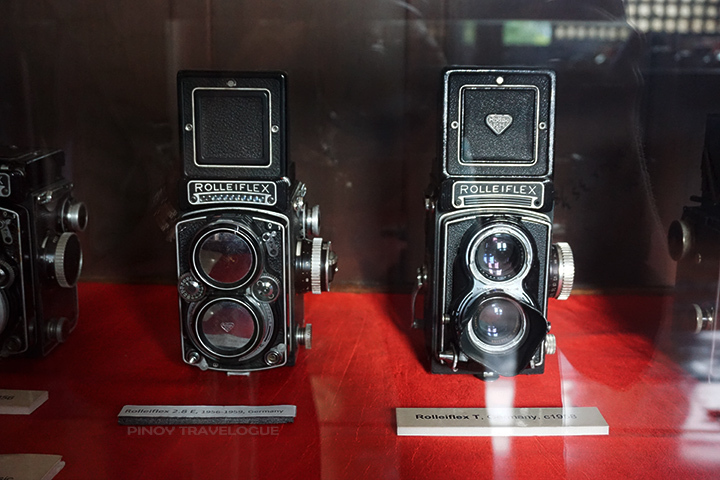 Another story narrates that Rolleiflex executives were surprised when they saw the camera on that Philippine banknote. Maybe as surprised as I was upon learning it was a camera, not a transistor radio as I've always thought (I don't even know the young man was Ninoy). The first Japan-made SLR (Asahi Pentax Spotmatic); the first spy cam (Minox) that comes with an earlier version of selfie stick and fish eye clip lens; an ancient VR Box (yes, these gadget accessories already existed before); the first camera used for space photography (Hasselblad); and the first 3D camera (Ontoscope) among others — name it, Galleria Taal can show it. Even Manny's first camera that he got when he was 12 is on display. Needless to say further because "firsts" of anything has a huge value — like that first-ever high-end mirrorless or DSLR you rewarded yourself of. Everything inside Galleria, apart from the Fujifilm-sponsored digital cameras and colonial-era images borrowed from John Silva, was Manny's precious valuable. What surprised me was that Manny's a civil engineer and a businessman, not even a professional photographer as anyone would think. Imagine how expensive a vintage camera, the flight abroad where he scored the rarest types, and cost of museum maintenance are; and the time Manny spent bringing these old, worn-out devices home and painstakingly restore them to their former glory, just to show and remind us, digital-age babies, how expensive and painful it was to get a good shot back then compared to how we snap-then-edit with breeze for our Instagram feed nowadays. That's an immeasurable amount of passion in there.